– There is a good chance that the Macedonian referendum on changing the countries name will result in a “yes” vote, and that the way to the constitutional implementation of the Prespa Agreement will then be clear. – There is every indication that the Macedonian membership in NATO will follow swiftly. The EU is committed to starting negotiations with Macedonia in the middle of next year. – Ratification of the Prespa Agreement in the Greek parliament, however, is far from guaranteed, and remains the biggest risk to the Prespa Agreement’s implementation. – International support for the agreement is overwhelming, Russia’s misgivings and efforts against the success of the referendum notwithstanding. – The EU is well advised to consider putting more effort into Macedonia’s (and Montenegro’s) EU accession, rather than tying them to other unresolved problems in the Balkans. – The latter will require positive developments in the EU after next year’s elections for the EU parliament, and also positive developments in the strengthening of the EU project afterwards. That of course is a gamble both Macedonia and Greece are taking. To understand the name issue between Greece and Macedonia, it is the best to look at the text of the Prespa Agreement, which has two main elements. First, the Republic of Macedonia will become the Republic of North Macedonia. Second, citizens of the state will continue to be called Macedonians and their language will continue to be called Macedonian. Under the terms of the agreement, Greece will withdraw its veto on Macedonia’s membership in the EU and NATO. The agreement combines the geographic with the political. If implemented, it will be clear that the Republic of North Macedonia is the Macedonian state, politically (i.e. the state of the Macedonian people), which is located in the northern part of Macedonia, geographically. Both Greece and Bulgaria are, or should be, content with this name, because it reflects the historical fact that the political region of Macedonia was divided in the Balkan wars between Serbia, Greece, and Bulgaria and later the Serbian part was included into Yugoslavia and eventually became the Republic of Macedonia after the Second World War. Now, being an independent state, it indeed extends politically only over the northern part of what was originally Macedonia (whatever “original” actually means). In this sense, the agreement has the potential to solve some very big issues, which have existed between Macedonia and Greece and Bulgaria for decades. Clearly, that includes the potential to resolve territorial issues with Greece and Bulgaria. In addition, the agreement steers away from the issue of the identity of the Macedonian people and of the name of their language. Therefore, it combines the geographic with the political so that there are no territorial or political misunderstandings. When addressing the “identity issue” most commentators, not only in the Balkans, start with one or more ethnic or cultural characteristics, with some combination of the hereditary, religious, and linguistic characteristics that combine into a collective identity. Those characteristics, separately or in combination, however, do not amount to a political identity. In fact, quite often the political identity provides for or strengthens the other characteristics of collective identity, not the least the linguistic one. Macedonian identity is no different. It can be traced to two key political events: the Ilinden uprising in 1903 and the Ilinden Convention of 1944, which led to the formation of the Republic of Macedonia within Yugoslavia. These were both political acts of self-determination. The codification of the language came later, as did the formation of the Macedonian Orthodox Church. The culture of the society and the state, however understood, has always been and remains multi-ethnic, with the two largest groups being the Macedonians and the Albanians, but with a significant presence of Serbs, Roma, Vlachs, Turks, and other minorities, and, in the past, Jews. The two Ilinden events are important because they constitute the state- and nation-building expressions of political will, the first unsuccessful, the second successful. They eventually justified the decision to go independent in the referendum of 1991. The two key Macedonian parties, the VMRO and the Social Democrats (former Communists), trace their political origins to both Ilinden events, though the former are inheritors of the earlier, anti-Turkish one, while the latter of the second, the anti-Fascist one. Both also claim credit for the anti-authoritarian politics in the first Yugoslavia (1918-1941): the VMRO for their role in political assassinations, and the Communists for their political opposition, despite being banned for most of that period. Indeed, VMRO resurfaced only during the collapse of Yugoslavia. 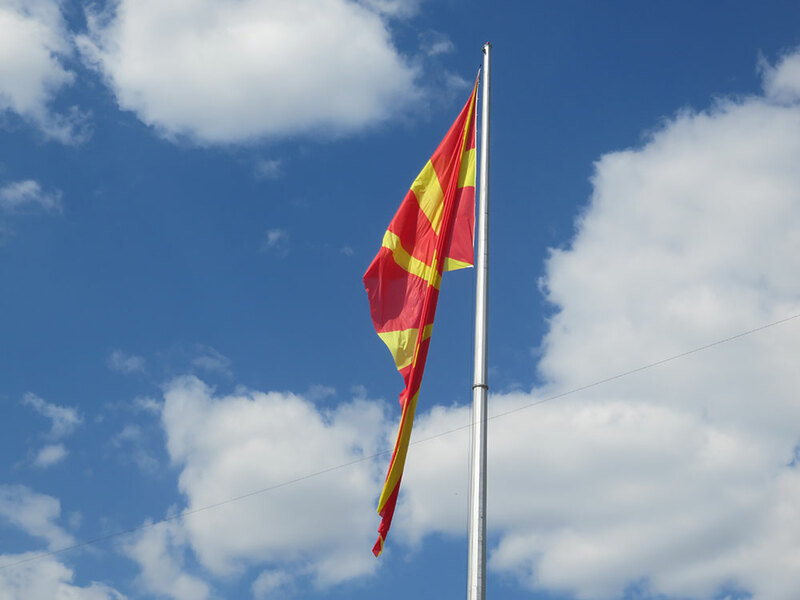 The VMRO previously attempted to go back to ancient Macedonia to find the roots of contemporary Macedonian identity, starting with the ill-fated choice of the state`s flag, which had to be abandoned in 1995, and has not proved to be persuasive at home or abroad. This is not unlike some other attempts to give historical basis to national identity and political independence, but it has been ineffective and anyway unnecessary: the Macedonian people identify with the leaders of the 1903 Ilinden uprising and with the participants in the 1994 assembly meeting, not with Alexander the Great or his father Philip. This previous VMRO strategy is now being abandoned, starting with the renaming of the airport and the main highway, which the VMRO, when in power, had named after Alexander the Great. A lot of history has happened in Macedonia, as in Greece, much of which is of global significance. However, it is not necessarily specific to either contemporary Macedonia or Greece. While authoritarianism is, historically but also today, the preferred way to address instability in the Balkans, it is not really available to Macedonia. State and nation building in Macedonia needs to be constitutional and achievable with democratic means. This is basically how political stabilisation has been achieved since independence, and most recently with the change in government in the early elections in 2016. Macedonian democracy operates under a system of consociationalism, a means of regulating the sharing of power in diverse societies, which relies on multi-ethnic participation in government. In the past, voters have rejected a slide towards ethnic polarisation, which was the strategy of the VMRO, as it had been in the early 2000s, which almost threw the country into a civil war. Luckily, there has always been party pluralism within the two largest ethnic groups, and a multi-ethnic coalition government. In addition, the Social Democrats have shown the ability to strengthen the constitutionality of the state with the Ohrid agreement, signed in 2001, which brought to an end the armed conflict between the Macedonian security forces and the National Liberation Army. In the years since, occasionally legislation has been introduced to improve on the equality of rights. The referendum on the Prespa agreement will be an additional step in the improvement of constitutional legitimacy, because it is expected that Albanian voters will support it overwhelmingly. Their representatives in parliament will then approve the changes of the constitution which will follow. That will improve the legitimacy of the constitution, as the first Macedonian constitution of 1991 was not supported by ethnic Albanians in the then referendum. The legitimacy issue is crucial because all the nation building political acts—in 1903, 1944 and 1991—have been decisions taken by ethnic Macedonians or have primarily been meaningful to them. However, inclusiveness, practiced even in Socialist Yugoslavia and since 1991 democratic has been central to state building. The process of state building will be advanced if not concluded with the vote in the referendum by voters from all ethnic groups and that will be reinforced later with the change of the constitution. That is irrespective of how ethnic groups or parties have voted. So, in a way, this is the “constitutional moment” for Macedonia. The question the referendum is to answer to is whether the costs of the change of the name is justified by the ends, which are membership of NATO and the EU. Voters are not asked whether the proposed change in the name and consequently in the constitution is proper, just, fair, or desirable in any sense of those words. Everybody understands that the country is giving up the right to choose its name in order to overcome Greece’s veto in the European and the Atlantic institutions, and France’s and the UK’s potential veto, on behalf of the EU, in the UN Security Council. The answer is going to be guided by concerns for stability and prosperity. Indeed, stability is the predominant concern given the regional dynamics and the lessons from history. Thus, NATO membership, which anyway can come more quickly, is crucial. But support from the EU with the start of accession negotiations is also seen as stabilising and may prove supportive of better economic and political development. As to the latter, Macedonia is a landlocked, small country in a slowly developing region with an insufficiently open economy and rule of law issues. The EU is, at least in principle, good for increased openness, in terms of exports to GDP, and in the support for rule of law and institution building. That should ensure support from both the public and the business community (this has been confidmed by successive rounds of opinion polling by the Balkan Barometer). Support for membership in NATO is also high. As a result, even though many consider the choice Macedonia is being as to make as unjust and distasteful, considerations of stability and prosperity are likely to win out, and the agreement will be in all probability approved by the voters in the upcoming referendum. The challenge to the legality of the referendum was also dismissed by the Supreme Court, though not unanimously. This expectation is supported by the strategy of the opposition. Although the VMRO and their sympathisers planned to boycott the referendum, after internal criticism the party decided to leave the decision up to their voters. They expect that the majority will vote in favour of the Prespa agreement, so the abstention is the softer version of opposition and relies on the possibility that less than 50% of registered voters, the turnout required to make the referendum valid, will turn up to vote. If all those who voted for VMRO in the last parliamentary elections in 2016 were to decline to vote, that would be enough for the referendum to fail. However, since then, and in particular in the local elections in 2017, support for VMRO has fallen significantly, so it is not clear how much of the public listens to VMRO currently. It is also the case that there will be those who want to vote against the agreement, but their chances of prevailing will be frustrated by the boycott. It is expected that ethnic Albanians will vote in favour, though their level of participation will be important. They are strongly in favour of membership of NATO, so that should be an important incentive. They constitute somewhat less than 20% of those voting in general elections. Therefore, the odds are very much in favour of reaching the required turnout, and that the result will be supportive of the Prespa Agreement. If that is the outcome, it is to be expected that VMRO will take a more supportive stance in the subsequent voting on the changes to the constitution. They will have to respect the outcome of the referendum. Thus, the chances are that there will be the required two-thirds majority in the parliament needed to change the constitution. Alternatively, early elections would be needed, which VMRO would stand to lose badly. The EU was quick to come to Macedonia’s aid in 2001 with the signing of a Stabilisation and Association Agreement. The EU Commission has been recommending to the Council that accession negotiations should start for a decade now, but that could never get past Greece’s veto. Since the Prespa Agreement was signed, the Commission and leaders from the member states have been engaging in a campaign of support for a positive outcome of the referendum. Among others, German Chancellor Angela Merkel made a rare visit to the country to urge the people to vote “yes”. The EU initially, i.e. after the end of the Kosovo war and even more after its Thessalonica Summit with the Western Balkan countries in 2003, adopted the so-called “regatta” strategy, which meant that the Balkan countries should accede to the EU in order of their fulfilment of the Copenhagen Criteria. However, after the accession of Croatia in 2013, the Commission appears to have adopted the strategy of concentrating on Serbia on the assumption that it holds the key to regional stability and Europeanisation. Thus, there was no rush to speed up the accession of Macedonia (and Montenegro). This may be changing, with the prospect of the solution to the dispute between Greece and Macedonia. Indeed, while developments in Serbia are important for Bosnia and Herzegovina and obviously for Kosovo, and by extension for Albania, neither Macedonia nor Montenegro are really parties to the territorial and constitutional problems of those countries. In fact, while there are problems between the Serbian and the Macedonian churches, the relations between the two countries are basically friendly and mutually supportive. There are no issues between the two countries or their peoples. The US for its part proved supportive of Macedonia especially with the decision to officially accept its official name of the Republic of Macedonia in 2004 (President Bush sent a letter to the Macedonian people urging them to vote “yes” in the referendum on September 17th). In addition, together with the EU, the US supported strongly the democratisation process that led to the momentous early elections of 2016. It supports Macedonia’s bid for membership in NATO. Early in September of this year, Defence Secretary Mattis visited the country to convey the support of the US administration for the successful outcome of the referendum. Macedonian Prime Minister Zoran Zaev has been careful not to alienate Russia. He acknowledges the disagreement about NATO membership, but has ruled out the suggestions that Russia is attempting to influence and undermine the referendum. Russia was the second country, after Bulgaria, to recognise Macedonia as an independent state. The relations have always been friendly. There are also cultural interests in Macedonia and in Ohrid in particular from where Christianity and the Cyrillic alphabet spread throughout the Slavic world. Russia faces the dilemma, similar to that in Montenegro, that while the accession to NATO of these two small Balkan states matters not at all for Russia’s security, it is embarrassing for Moscow it because it has made opposition to NATO central to its security policy. Therefore, it has to protest, but not unreasonably so. Russia does support President Ivanov, who is strongly opposed to the Prespa Agreement, and has announced that he will boycott the referendum, but as in many other cases in the Balkans, that means betting on the losing side. Russia has often supported the losing side unnecessarily, but quite regularly lately. After the referendum in Macedonia and after its constitution is amended, Greece should ratify the agreement. The government keeps assuring the public, at home and abroad, that it has the votes in the parliament, though not of the governing coalition alone. The Independent Greeks party, the coalition partner of Syriza, is opposed to the Prespa Agreement, so the votes of other parties in the parliament will be needed. It is not clear what happens if the votes are not there in the Greek parliament. The next Greek parliament, after the elections in 2019, will likely be less inclined to approve the agreement with Macedonia. It is interesting that Greece has fallen out with Russia over their attempt to influence the Greek government and Parliament not to support the Agreement. However, once the Prespa Agreement is indeed ratified, there is little incentive for Greece not to honour it by standing in the way of Macedonia’s membership in NATO and the EU. Indeed, one hopeful sign is that the Greek government has not been toppled since the signing of the Prespa agreement, despite mass demonstrations against it across much of the country. That might mean that the Greek public is indeed inclined to go along with the letter, though perhaps not with the spirit of the agreement, which recognises the existence of the Macedonian state and the Macedonian people on its northern border. There is a good chance that the Macedonian referendum on changing the countries name will result in a “yes” vote, and that the way to the constitutional implementation of the Prespa Agreement will then be clear. There is every indication that the Macedonian membership in NATO will follow swiftly. The EU is committed to starting negotiations with Macedonia in the middle of next year. The ratification of the Prespa Agreement in the Greek parliament, however, is far from guaranteed, and remains the biggest risk to the Prespa Agreement’s implementation. International support for the agreement is overwhelming, Russia’s misgivings and efforts against the success of the referendum notwithstanding. The EU is well advised to consider putting more effort into Macedonia’s (and Montenegro’s) EU accession, rather than tying them to other unresolved problems in the Balkans. The latter will require positive developments in the EU after next year’s elections for the EU parliament, and also positive developments in the strengthening of the EU project afterwards. That of course is a gamble both Macedonia and Greece are taking.